DALLAS, TX--(Marketwire - January 5, 2011) - NewMarket Technology, Inc. (PINKSHEETS: NWMTD) (OTCQB: NWMTD) today announced strategic meetings scheduled in New York City later this month with Savanna East Africa, Inc. (PINKSHEETS: NVAE) (OTCQB: NVAE) and Vita Developments (www.vitadev.org) hosting the Kenya Ministry of Housing to explore affordable housing upgrade solutions to improve Nairobi slums. 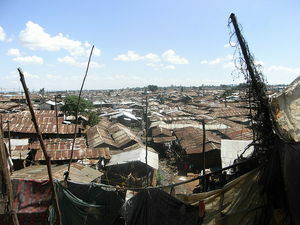 Kibera is a major slum area of Nairobi, Kenya. Most people living in Kibera have little or no access to basic necessities, such as electricity, clean water, or sewage disposal. The area is estimated to have some 50,000 AIDS orphans and inadequate school facilities in Kibera contribute to the poverty cycle for residents. The Kenya Ministry of Housing has launched a slum upgrade project that has already piloted a relocation of Kibera residents to a temporary housing area pending a tear down and rebuild of their former housing facilities. NewMarket, Savanna East Africa and Vita Developments are partnering in Kenya in an effort to contribute to and accelerate the Ministry of Housing's slum upgrade project. NewMarket and Savanna East Africa's Affordable Housing Initiative was launched by former NewMarket Board Member, the late Major General Hugh G. Robinson. During the Johnson Administration, General Robinson was the first African American to ever serve on Presidential staff. After the Army, he served as the Chairman of the Federal Reserve Bank of Dallas. General Robinson founded the NewMarket and Savanna Affordable Housing Initiative to not only design and construct housing with costs inside the capacity of lower income residents, but with 'dignity' and 'sustainability' as cornerstones of the design concepts. NewMarket and Savanna work on housing projects with the potential for high, rapid profitable growth. NewMarket and Savanna believe socially responsible projects have a better potential for long-term success. To enhance the long-term success of affordable housing projects, NewMarket is working with Vita Developments to ensure each community of affordable homes has a church or other religious institution, school, market center and health clinic in order to help the community become self-sustaining and not remain in need of serial charity. Separately, NuMobile, Inc. (OTCBB: NUBL), China Crescent Enterprises, Inc. (OTCBB: CCTR) and Savanna East Africa have partnered to build a wireless broadband network in Nairobi, Kenya. The joint project was developed through the NewMarket Technology Greenfield Partnership Program. The broadband network is intended to provide a wireless meter reading capability to local utility companies. After successful completion of the testing phase, the wireless broadband project is expected to expand throughout Nairobi, followed by expansion to additional cities and countries throughout East Africa.